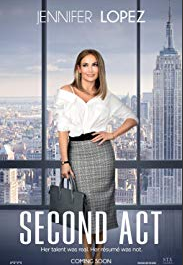 “Second Act” is “Working Girl” meets “Maid in Manhattan”. Maya (Jennifer Lopez) works in a Mass Merchandise type of store. She has big marketing ideas that she shares with the stores Executive. The Executives love Maya’s ideas, but because Maya does not have a college education she is not taken seriously. “Second Act” is entertaining and light-hearted. The story is a bit sketchy, disjointed and underdeveloped. There are several BIG surprises that occur and you have to wonder why the stage was not set appropriately. This is what keeps “Second Act” from being a 4 or 5 Star movie. Jennifer Lopez works with what she was given. I loved the business wardrobe she wore in the movie. Additionally the sound track is very good. Alas…”Second Act” is best viewed on Cable. “The Big Sick” is a fine display of a well-executed Romantic Comedy! “The Big Sick” is based on the real-life courtship of Kumail Nanjiani and Emily Gordon. Kumail is a stand-up comedian in Chicago trying to catch a break. He also moonlights as an UBER driver. During one of his stand-up comedy gigs he meets Emily Gordon. Kumail and Emily hit it off. They start spending a lot of time together. Kumail’s family is trying to arrange a marriage for him with a Pakistani Woman. When Kumail goes to visit his family a Pakistani Woman always arrives to meet him. After every visit Kumail places the picture he has received from the prospective bride in a cigar box in his bedroom. The cigar box is full of pictures of women that Kumail’s family has tried to set him up with. “The Big Sick” is engaging, funny, heart-warming, entertaining and well executed. It’s an excellent story and reminds us about prejudice in today’s society. This movie is a reminder that “Love has no Color”. “The Big Sick” is definitely worth all of the hype it has been receiving. Currently the “The Big Sick” is open in limited-release. It open wide on Friday July 14th. This was the highly anticipated sequel to the 2012 hit “Act Like A Lady, Think Like A Man”. Well as often goes a sequel is usually not as good as its predecessor. “Think Like A Man Too” is such a sequel. Instead of being funny, Kevin Hart is annoying and irritating in the movie. I was hoping that someone in the movie would slap him. There is being funny and then there is being raunchy. Kevin was just plain raunchy. The story is somewhat predictable, but there are a few unexpected surprises. The movie is silly and just plain stupid. The first installment was very good. “Think Like A Man Too” is disappointing… I would only spend money seeing this movie if you have absolutely nothing to do this weekend.